So only a day after picking up GT5 Prologue I decided that the PS3 pad really had to go…and that meant ordering an import Dual Shock 3 from Hong Kong. A couple of days later and the pad was delivered. 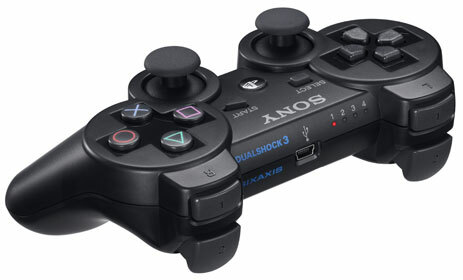 It certainly doesn’t address many of the flaws of the PS3 pad but it did do at least two vital things – add weight and provide rumble support. The rumble feedback makes all the difference and add’s to the realism in GT5 (thoughts on this soon). It also makes gaming on the PS3 feel more familiar. When rumble was first added to the PS1 pad’s it all felt a bit odd at first but it then became default for all consoles and it’s taken as a given. Gaming on the initial PS3 pad just felt…empty. This has now been resolved and it’s also good to get back to a pad with weight which also feels more rebust than the creaky original. It’s a real shame though that Sony didn’t think to redesign the appalling triggers, fix the dead zones on the sticks and tweak the design so that they are less cramp inducing. Many can debate on which console is the best. Little will argue that the 360 pad is one of the best ever which smacks the PS3 pad silly. When I used Graham’s the other week it struck me instantly how hopeless the lower triggers were. Almost like the guy who designed them actually wanted your fingers to slip off them. Most odd. So thinking I was going mad I stuck “Smith & Wesson” + “Trigger” into Google Images, and sure enough – its all old-school concave curves there and most definitely not convex. Note to SONY Management: engage brain before signing off final pad design, don’t leave it to Marketing.